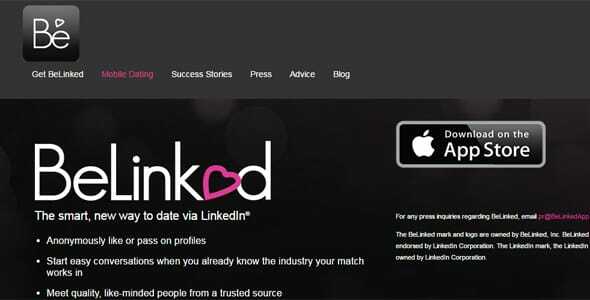 The Short Version: BeLinked is a dating application that connects users through their LinkedIn profiles. Prominently displaying a person’s job and educational background, this mobile dating network cuts straight to the heart of someone’s personality. With verifiable identity and a vast network, BeLinked offers high-quality dating prospects for users of all ages and demographics. This is an app for serious, career-driven singles looking for love on an easy mobile platform. The answer can be an immediate turn-off or an instant connection (“You’re a dolphin trainer? I’ve been to Sea World!”). Whether it’s good, bad, or in-between, a person’s career often serves as a placeholder for their goals, temperament, and life philosophy. BeLinked’s singles find compatibility based on career. Talking about work gets at the central aspect of a person’s life: what a person chooses to dedicate time and energy to. In many cases, just knowing a person’s profession can convey the viability of the date in an instant. If you could start out with a common foundation to base your attraction, half the work of the date is already done for you. 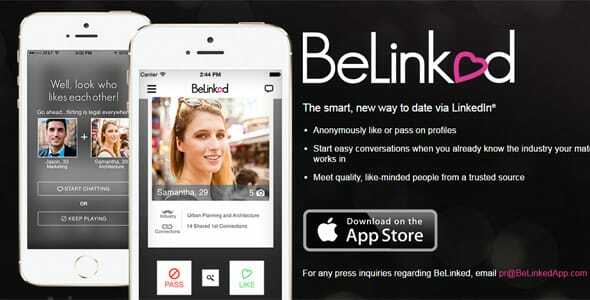 Founded in 2013, BeLinked is a dating application with a new approach to dating. Its matches are made by using LinkedIn’s membership to identify and highlight a person’s career industry. With 400 million profiles globally, LinkedIn is a goldmine of high-quality dating prospects. BeLinked draws from this database to bring career-driven professionals together. 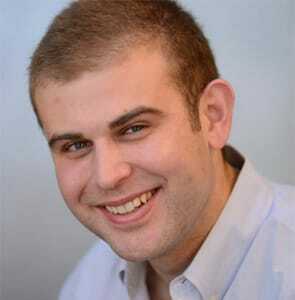 Founded and CEO Max Fischer tells us this method enhances the dating experience for the app’s users. The sole founder of BeLinked has a background in business and an eye for entrepreneurship. With a degree in finance from the Wharton School at the University of Pennsylvania, Max started out as an investment banker. However he soon discovered a trend among his friend group that sparked his interest. Max Fischer, founder of BeLinked, realized that LinkedIn had the potential to help singles find dates. “I noticed that people were starting to go on dates through LinkedIn,” he recalls. It makes sense: on LinkedIn you can see who’s viewed your profile and choose to send that person a message in a casual networking environment. On his date, Max felt he made a connection with a higher caliber person than he’d typically met. He was thrilled. He not only had a successful first date — he had a business venture. He saw the opportunity to use LinkedIn to network beyond professional objectives. His groundbreaking idea became a dating app that links users by job industry. Today, BeLinked helps professionals find each other faster and easier. This app doesn’t reinvent mobile dating; it makes it more effective. BeLinked understands the importance background information: where someone’s from, what they do for a living, and where they went to school. At least for a first impression, such stats are critical. You can find all that out by using BeLinked. Before even going on a date, you’ll already know the industry that person works in because LinkedIn’s user base offers certainty and authenticity. The key to BeLinked’s success is in the caliber of the LinkedIn members who download the app. As a whole, this app offers valuable information and could lead to dates that are a cut above the rest, saving users a lot of time dredging through incompatible profiles. The company is committed to providing more accountability, trustworthiness, and transparency in mobile dating. By using LinkedIn’s vast and dependable network, BeLinked can verify a person’s identity and career for you. BeLinked offers values-based dating. This dating profile will prominently display your job and industry for potential matches. Salient personal details are what gain traction. Your dating preferences can be filtered by gender, age, distance, industry, and schooling. The set-up is familiar. To start out, you can log in with LinkedIn, edit your profile, set your match settings, and start swiping. A no-pressure system lets you anonymously pass on profiles. When someone you like likes you back you’ll be given the option to start chatting. Similar to other mobile dating apps, BeLinked lets users quickly decide to Pass or Like on a profile. The app doesn’t stop at just your love life. It’s an interactive network where users can suggest matches for their friends at the press of the button. Anyone with a LinkedIn profile can join and start mingling immediately. You’ll find yourself surrounded by like-minded individuals. To ensure your dating success, a blog and advice section on the website offers valuable tips on navigating the mobile dating world. Belinked has users of all ages and demographics. What they have in common is that they all actively seeking someone as self-motivated and career-driven as they are. “It’s mostly people out of college who are professionals and well-educated — similar to how LinkedIn mostly has professionals,” Max said. Right now, BeLinked is exclusive to iPhones, but Max tells us that his team is developing an Android version of the app, aimed for release this summer. Couples who meet through LinkedIn are grounded by similar values. The common issue with Facebook-based dating applications is that they can be too casual for serious people. By meeting through LinkedIn, however, singles open themselves up to a more grounded and conscientious group. BeLinked is filled with real people who want a real connection. Because of the setting, users enter the app with the mindset of higher standards and increased decorum — something Max talks about with pride. “It’s all about the quality of the user base at the end of the day,” he said, “because those are the people who make the connection happen,” he said. Many first dates and budding relationships later, BeLinked has created a unique way to meet people in your professional network. Overwhelmed with success stories, Max hears many thank-yous from friends and strangers. He says he feels excited whenever he talks to people who have been on successful dates because of his app. Moving beyond the superficial, BeLinked links singles based on their careers and aspirations. With effective matching, clean profiles, and a high-quality dating pool, this app is quickly garnering attention as a pioneer in the mobile dating industry.